This Christmas Eve finds us at sixes and sevens, our careful plans upset. We were going to attend the Christmas Eve service at the Methodist church in Lincolnton tonight. That takes me right back to childhood. My grandfather was the choir director of the Methodist church in our hometown for 40 years and would start planning his elaborate Christmas Eve midnight service in August. We would watch the Mormon Tabernacle Choir broadcast every year for inspiration. His programs were spectacular; I never even realized it was 1 AM by the end, I was so rapt! The Methodist church was right down town, and our town was glorious as a Currier and Ives print at Christmas, with lights everywhere and carols piped from speakers on the corners of the buildings. We would walk through the still downtown, music echoing through empty midnight streets, into the jeweled pools of light through the stained glass windows, and through the front doors. I always felt privileged to go to the Methodist service. The Lutheran service my other grandparents attended was earlier, and so until I was deemed old enough to attend the midnight service I was relegated to the Lutheran service out on the edge of town, also nice, but not as magical. Lincolnton is the same sort of town, with carols playing downtown, and lights and horseback rides and a big, fancy Methodist church, so going to the Christmas Eve service is like stepping back in time. This afternoon, however, while picking up last minute necessities for tomorrow (more on that later), it was raining and such thick fog rolled in we couldn't even see Little Mountain, though we were standing at its base. We decided to forgo the half hour drive through rain, fog, and darkness and watched the original Miracle on 34th St. instead. The reason we had to pick up Christmas necessities is that, instead of traveling to Asheville with my parents to spend the day and night at my sister's, we are now hosting last minute because my niece suddenly developed an extremely high fever, over 105 at one point today. She has tested negative for pneumonia and strep throat and flu. At this point the doctor thinks it might be croup, since she also has a terrible cough. We're mightily worried about her, and of course wouldn't impose on my sister (who also has her in-laws visiting from Canada) even if we were willing to expose ourselves to the illness. I had nothing suitable for Christmas dinner thawed out so we hastened to the store, which thankfully had leg of lamb on sale for half-off. I hope I can produce an acceptable replacement for the 20 pound turkey my sister planned! Although the holiday has started off more hectic than I'd hoped, I am thankful we are safe at home, with no one ill (knock on wood). The children are disappointed to miss their cousins, but have their grandparents here. My youngest did just announce two days ago that he wants a spaceship "with GPS" from Santa. That's the first I heard of that, so he's destined to be disappointed in that. Of all my gifts, one of the greatest are my kindred spirits and those I love. 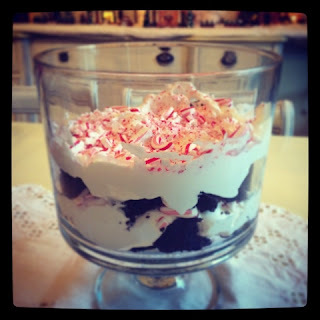 I want to thank you for sharing my blog and ideas and I thought I'd share a favorite Christmas recipe with you all. This is a far healthier treat for the holiday, packed with antioxidants. I adapted a Shape magazine recipe into this one. 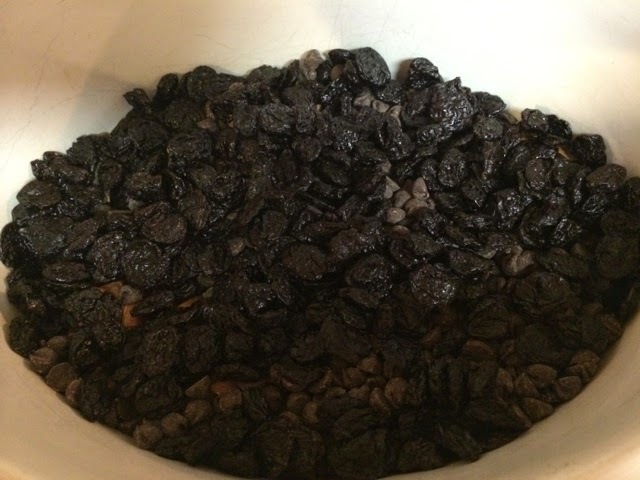 It features dried cherries, a family staple. My grandmother grew up on a cherry farm on Lake Michigan and we pick up boxes and boxes of dried cherries to bring home whenever we visit. 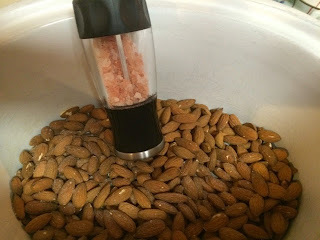 Since I use raw almonds I salt them before cooking. You could toast and salt them ahead of time but I rarely make this far enough in advance to have the time. I recently read an article about all the health benefits of Himalayan pink salt, so I used that. I spread the almonds in a layer over the bottom of the Crock Pot. I grind a layer of salt over all. 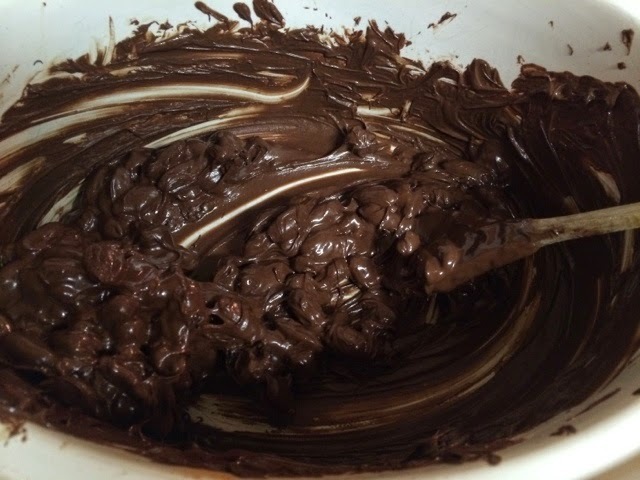 Layer dark chocolate over the almonds. 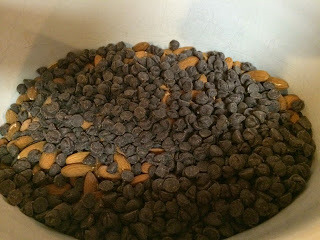 Spread the 12 ounces of dark chocolate over the almonds. Layer cherries over the chocolate. 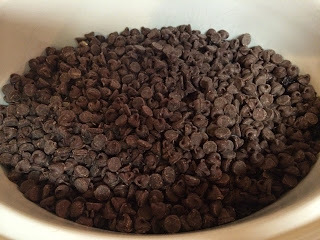 Layer cherries over the dark chocolate. Layer semi-sweet chocolate over the cherries. Spread the semi-sweet chocolate over the cherries. Then add the remaining spices to your taste. I probably use about a half teaspoon of each. Cook in the Crock Pot on low about 2 hours, stirring occasionally. When the chocolate is melted drop by spoonfuls onto a pan covered with parchment paper and set out to harden. 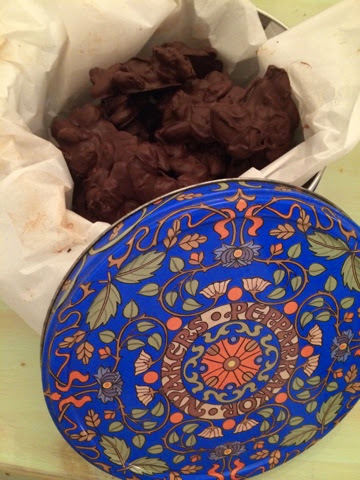 When the chocolates are cooled and firm remove to a covered tin or plastic container. I sometimes switch out the ratio of chocolate so I use mostly dark chocolate for these; it just depends on what I have one hand. I always have almonds and cherries because I freeze them as part of our food storage. I hope this recipe becomes one of your favorites. May you have a blessed and fulfilling holiday and wonderful new year. When we visited Hilton Head, South Carolina over the summer I noticed giant pinecones on the ground while hiking in the Sea Pines Nature Preserve. I felt a stab of nostalgia on seeing them, because my mother and grandmother each kept big baskets of pinecones by their fireplaces throughout my childhood. They always wanted really big ones, which are hard to find, so whenever we would see them somewhere we children would be dispatched to gather the biggest ones. I did not pick any up, or send my children into the undergrowth to look for them, in part because my daughter went around a curve in the path and came face to face with an alligator while we were hiking! We have a gas fire as well, so we can't use pinecones as fire starters. However, a few months ago I found an old metal waste basket with a Pennsylvania Dutch design painted on it in a thrift store in Lincolnton, and I just had to have it. My grandmother had the matching dust pan when I was little, but hers was copper rather than green. I bought it, I really don't know why because I didn't have anywhere to put it. On the drive home I started to think how cute it would look sitting next to the fireplace. Then I started to think about how nice some pinecones would be inside it. Then I really wished I'd picked up some of those big pinecones this summer! 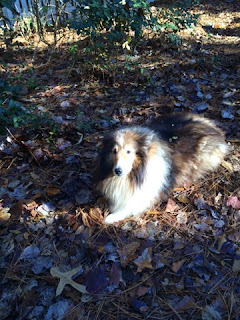 Luckily for me, we returned to Hilton Head in October, so we went back to the trail where we saw the pinecones to gather some. I found to my dismay, most of the really big ones were old and rotten. Evidently you need to pick those up in summer. We got the biggest we could find. Since we can't use them in the fire I decided to scent them with essential oils. The heat of the fire will bring out the scent. 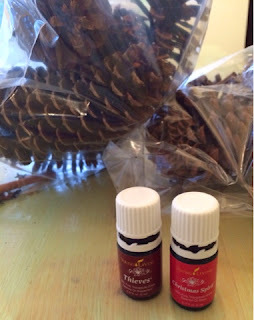 I used Young Living oils to scent the pinecones. 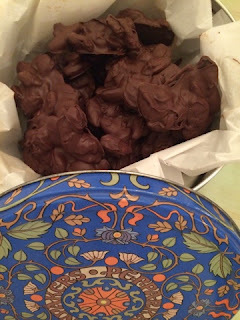 I blithely brought the pinecones in and had them sitting on the kitchen counter as I prepared to scent them. Then I noticed a tiny baby Palmetto Bug crawl out of one! "Palmetto Bugs" are the euphemistic name given to giant flying and rather aggressive cockroaches who populate the South, from around Greenville, NC on down. I definitely don't want those in here! A quick Pinterest search turned up the tip that you should bake them at 200 degrees Fahrenheit for an hour to dry them out and kill any vermin hanging around inside. Make sure to watch them so you don't end up with a fire. Baking them will also cause any closed cones to open so you can scent them more thoroughly. Line a baking pan with aluminum foil and bake the cones on that. 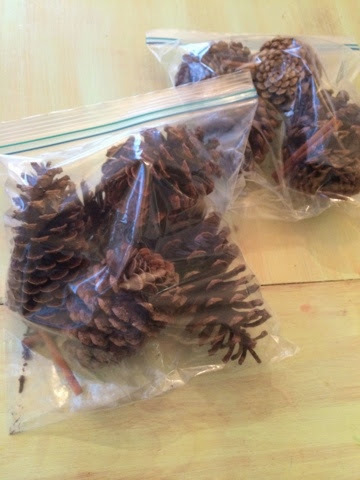 After The pinecones are baked and cooled place them in a zip-close plastic bag. 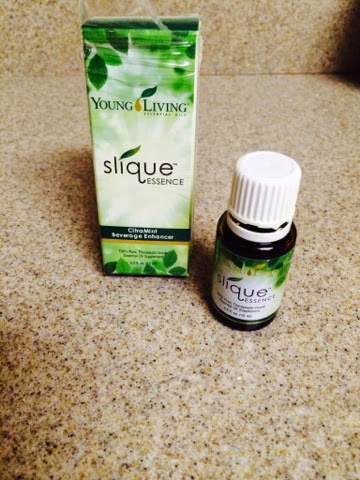 Add about 10 drops of the essential oil of your choice. I used 8 drops of Young Living Thieves and 2 drops of Young Living Christmas Spirit oil blends for a cinnamon and clove scent with a touch of orange. Close the bag and shake. Then open the bag and spritz with water using a spray bottle. Close the bag and shake again to thoroughly coat the pinecones. 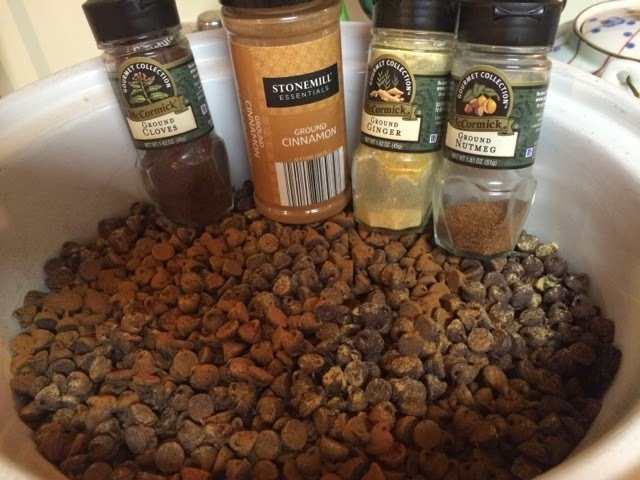 I added several cinnamon sticks and whole cloves to my bags to scent them even further. Leave the pinecones in the closed bag and shake them up again every few days for 4-6 weeks. Even inside the closed bags, ours scented the whole side of the house near our laundry room where they were "steeping". These make a terrific gift for anyone, especially those with a fireplace, since pinecones are flammable enough to make great fire starters. 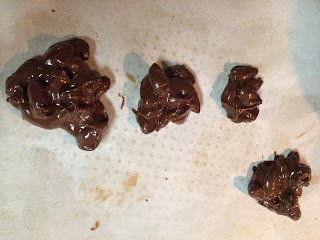 This method is much easier than scented wax-dipped pinecones I've tried in the past. 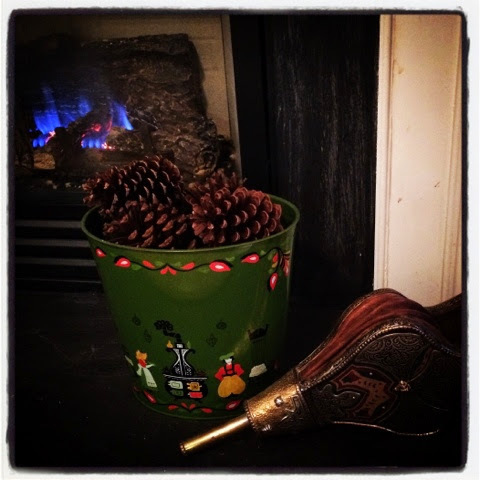 We are really enjoying our yummy-smelling pinecones and our fireplace in these cold, dark days, and I hope you will as well! As always, contact me to order your own Young Living products. Keep cones in the bag 4-6 weeks, shaking every few days. 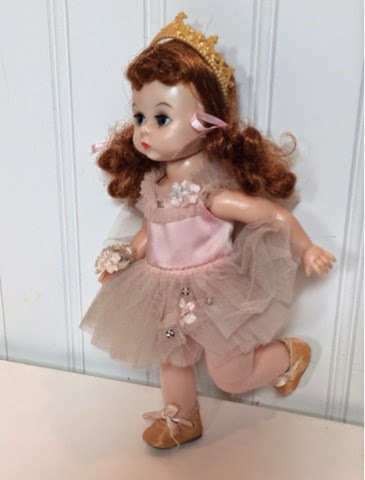 Wendy started ballet lessons and she practices ceaselessly, hoping to someday dance the part of the Sugar Plum Fairy in the Nutcracker. Such a graceful and determined girl, she's bound to achieve her goal! I just reached a longtime goal of my own: I got my red star on eBay! This means I have positive feedback over 1000. Feedback is a huge deal on eBay, as it determines your seller fees, your listing visibility, and even whether you can be a seller. It's especially important to me, because I became a Top Seller on eBay through my exemplary customer service, not through large sales volume. I'm a tiny one person operation. I want to thank all of you who've purchased from me and left me positive feedback, and I have almost everything in the store 20% off through the 20th to celebrate! Check out my sale and my fab new star in Atelier Mandaline. This was a pretty straightforward restoration. 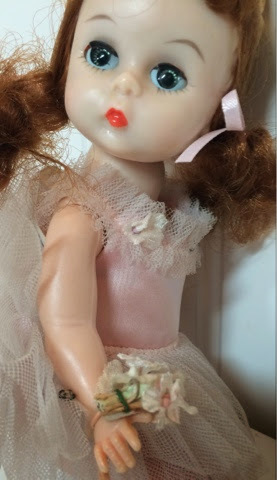 I actually finished Wendy last week, but I've just been too busy to write a blog post for her. This time of year is just so ridiculously hectic, and we've added to that by starting the process of putting our teen in braces. I've spent the last two mornings sitting in the orthodontist's office. All the children and I are being evaluated, and I think all but the youngest of us will be fitted with braces pretty much immediately. 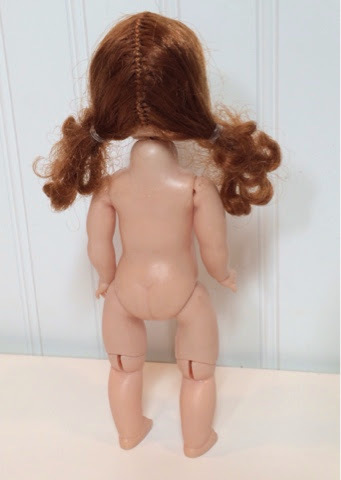 At any rate, Wendy just needed some cleaning and re-stringing. She had very tiny splits starting inside her hips so I just dabbed some epoxy on those; nothing major. 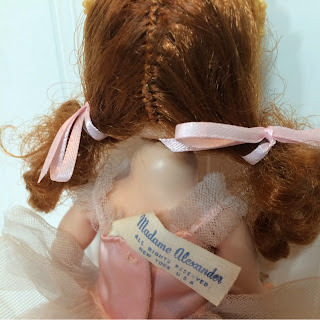 Wendy has the same unusual wig stitching as my Wendy's wedding doll, and that is the same kind of doll, a bent knee walker from the late 1950s-early 60s. 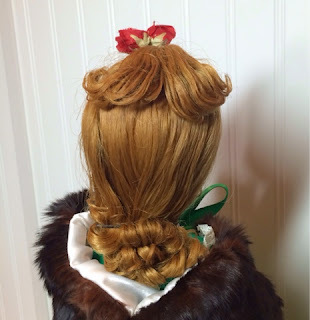 This wig was messy but seemed to have been arranged in curly pigtails originally. I've seen this hairstyle before, but rarely, and it's especially unusual in red! I gathered the red curls back into low pigtails, and I think it's adorable. 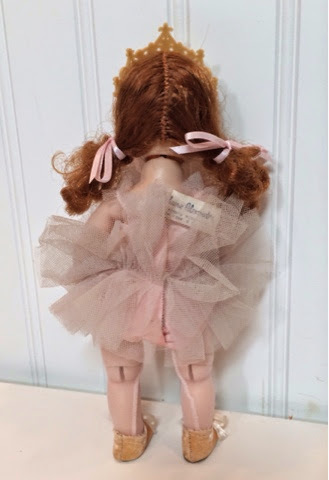 After restoration I dressed Wendy in a tagged Madame Alexander ballerina costume from the late 60s-early 70s, still with the satin tie shoes correct to her period. I couldn't resist giving her a little gold plastic tiara. She holds the bouquet original to her outfit. Wendy dressed in a tagged costume. As always, I strung Wendy rather loosely to protect from splits. Her walker works, but you do sort of have to press her hips together when she walks to get her head to turn. The loose stringing does allow for a great range of poses, essential for any ballerina! Wendy can hold many poses. Wendy's paint is perfect and her sleep eyes work well. She's just a wonderful example of the late 50s Wendy-Kins! She can sit and stand alone. Her paint is perfect and original. I have tons of Wendy-Kins listed right now. They date from one of the earliest straight-leg walkers to the 1990s. 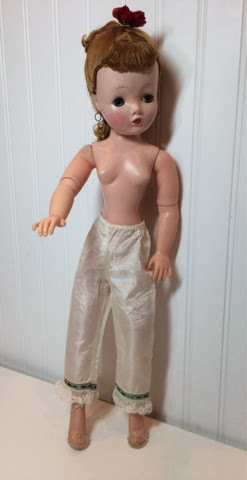 I actually have the Wendy Loves Learning to Sew kit from 1994 right now, mint in the package! I searched and searched for this and won it for quite a high price, trying to get it for my daughter's Christmas. She's been learning to sew and I wanted her to have her own tape measure and things. 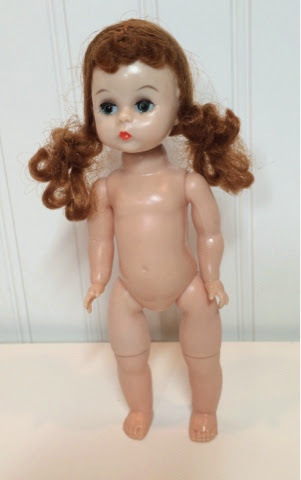 The Wendy kit comes with a Wendy doll, the materials and instructions for three outfits for her, extra hose and a sun suit for her, and then all the regular sewing basket things, like a thimble and needles and things. It's super, super rare, so I was more than thrilled to find it. I envisioned her happily sewing for her doll, with my assistance (knowing my daughter this was probably a pipe dream, but you know we all have to dream!). Unfortunately, my mother-in-law decided to buy a different sewing basket for her birthday and had it mailed here without telling me, so it was opened and used immediately, leaving me stuck scrambling to find a different gift. 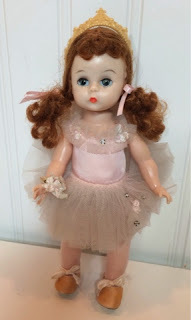 Now the Wendy kit is for sale in my store, Atelier Mandaline, along with Sugar Plum Wendy, so please check. Rare Wendy in her sewing basket. Outside of fixing dolls and taking people to the orthodontist I've been trying to keep up the Christmas traditions of my youth and pass them to my own children. Every year we make a gingerbread house. 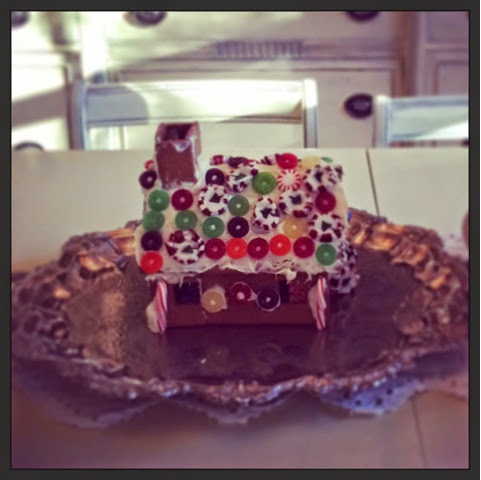 I used to make it from scratch, cutting the pieces with my mother's old cutters, baking it, melting sugar glue. This was a process so long and difficult my husband referred to the house as the "cussing house". If you've never tried to use sugar glue, it involves dipping things in boiling sugar and then fitting them together. If you drip boiling sugar on your hands and then have it stick so you can't wipe it off you might say a thing or two as well! Luckily for us, Ikea sells a gingerbread kit already baked. Then we also found gingerbread tree ornaments at Ikea. 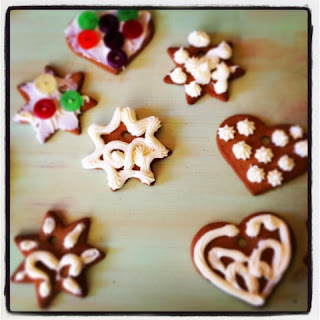 Apparently, baking cookie ornaments is a Scandinavian thing. We used to do this quite often when I was a girl, and my kids would always listen in horror as I described baking and decorating cookies and then NOT eating them because they were tree ornaments. This year they got to decorate the tree ornaments themselves without having to bake them first. Actually one year my mother did give in to the clamoring and let us taste the gingerbread house and ornaments after they'd been on display for several weeks. They were awful of course, dry as dust and hard as bricks! We never begged to taste them again. Maybe I should let mine eat some so they learn! I once saw a "Sugar Plum Tree" at a Christmas display. It was all decked out in ornaments that looked like lollipops and cupcakes and things. 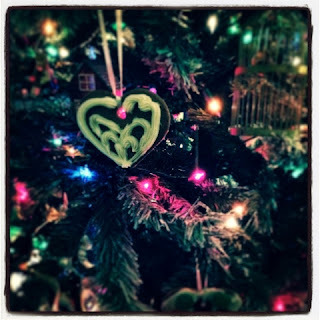 The cookie ornaments give our tree that sugar plum look without me having to buy all new ornaments. I do like these, and the gingerbread house, for the smell. Our living and dining room smell like cake because of the frosting right now, and it's perfect for the holidays. That's the only thing I miss about baking our house and cookies: when you bake them these decorations smell fabulous and your house smells like you're baking all the time! I'm trying to avoid eating all the seasonal sugar plums drinking the Young Living Slique oil, and I've lost five pounds in the first week! I think I'm going to order more of this. Getting thinner is the best present I can imagine! Like my Facebook page, Naturally Amanda, for more Young Living tips, and, speaking of scents, make sure to watch for my scented pine cone tutorial. Those make great gifts! You all know I write often on the power of natural herbal remedies, and recently I've gleaned even more evidence of their efficacy. I'll start with an old story however, a family legend to illustrate the power of humble peppermint. One day, about a century ago, my great-grandparents were young parents caring for their first child, my great aunt Faye. Faye was a newborn and that awful day was discovered in her cradle still alive but not breathing. Grandma and Grandpa called the doctor, Dr. Flood, in a panic. His solution was that they should start running toward town (they lived on a cherry farm on Lake Michigan outside of town) and he would start running toward the farm. I have questions about this. My grandparents got a car later, but why didn't they have a horse and carriage? Or just a horse? Why didn't Dr. Flood have a horse? Maybe it would have taken too long to saddle up. Every second was at stake since baby Faye wasn't breathing. At any rate, they snatched up Faye and ran toward town and thankfully met Dr. Flood fairly soon. Dr. Flood, on meeting them, took a vial of peppermint oil from his bag, opened Faye's mouth, and placed a drop on her tongue. Faye gasped... and started breathing! And she was fine! She grew up and got married and had children and lived well into her 90s. All because of powerful peppermint! That's an absolutely true story. It's been passed down through the family ever since. My great-grandparents went on to have nine more children, eight of whom lived to adulthood, including my grandmother. You can find the recipe for the trifle shown above, which uses Young Living peppermint oil, on my Facebook page, Naturally Amanda. We tend to forget, I think, that not long ago at all herbs WERE medicine. There weren't any other drugs. Natural remedies haven't lost their usefulness, but we have mostly forgotten how to use them. 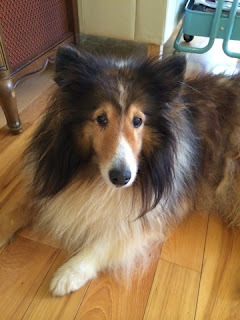 Our Sheltie, Ilse, has been suffering from a goopy eye recently. When Ilse was a puppy she was stung in the eye by a yellow jacket. The sting tore her lens and she had to have it fixed via laser eye surgery. Ilse has allergies we well, and the affected eye often gets irritated and infected. I've gotten concerned about the amount of times we have her on antibiotics for her eye. It doesn't seem to reduce the frequency of the attacks and the cost of taking her to the vet every time is really painful. I decided to see if I could find a natural eye wash that would help. Looking on Pinterest I found a wonderful site with all kinds of natural remedies for animals called the Ottawa Valley Dog Whisperer: http://ottawavalleydogwhisperer.blogspot.ca/2013/09/eye-infections-and-conjunctivitus-diy.html. I used the eye wash recipe with water, chamomile tea, and aloe vera juice. You can buy aloe vera juice but I squeezed some fresh from our house plant. I bathed Ilse's eye and administered as an eye drop three times a day for a week. The second step for treating the animal is to feed them immune boosting treats. I cooked up some homemade dog food using chicken livers, spinach, and oregano. Chicken livers are very high in Vitamin A, essential for the immune system. This recipe will work for humans as an immunity booster as well, if you can get your family to eat it! Melt bacon fat in a saucepan and cook down spinach and oregano until both are soft and reduced. Add chicken livers in their juice. 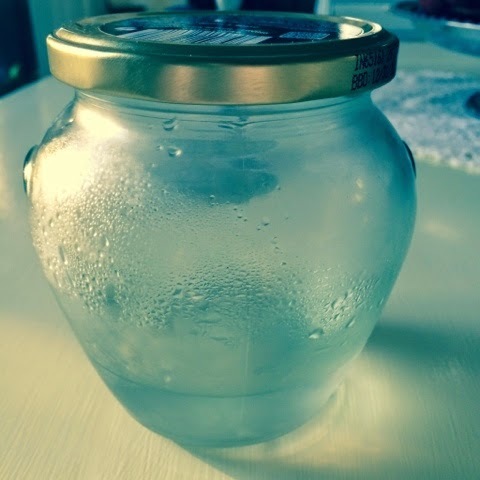 If there is not enough liquid add filtered water to cover all. Bring to a boil and then simmer until the livers are cooked through and beginning to fall apart, about 20 minutes. When cool stir in the oregano oil. You can replace your dog's commercial food with this mixture or just add some to its regular food as a supplement. Make as needed for at least one week. After a week, Ilse is fine. After a week of treatment Ilse's eye is much better. She is camera shy, so I couldn't get a really good photo of her eye, but here she is running and playing with our other dog. I should also say, these dogs aren't spring chickens. 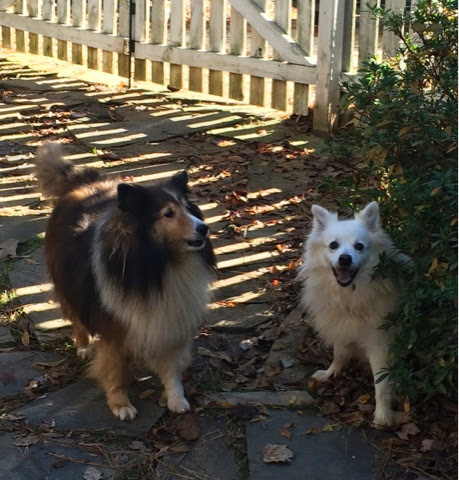 Our Sheltie is 13 and our Spitz is 12. I think you can really see the benefit of good wholesome nutrition for animals as well as people! You might remember our Spitz had a terrible infection last year which I was able to heal with oregano and oregano oil. You can find that story here: http://mandalineartfulliving.blogspot.com/2014/01/plant-power.html. Recently I've been reading some Internet posts warning that only oil of oregano is antibacterial and garden variety oregano won't work. Don't you believe that! There are different varieties of oregano and the wild kind is typically used to distill oregano oil. The essential oil is more concentrated, but garden variety oregano is still a powerful natural antibiotic. I grow it all over our garden and add it to as many recipes as I can. I also keep oregano oil on hand as a medicine cabinet staple, just in case we are ever out of oregano when we need some. Oregano oil has a strong bitter flavor, and it stings a bit. I know this because I have a cough I can't get rid of and I've been drinking oregano oil in water. I have a really hard time sticking with it because of the flavor. So, you will probably want to add the minimum to your dog food and gradually increase it to make sure they'll tolerate it. You can order Young Living Oregano Oil from me. Young Living also makes a collection of oils especially for pets' health called Animal Scents. Go to www.youngliving.com and type in my number 2256091 to order or become a member yourself. Don't forget to like my Facebook page, Naturally Amanda, for many different wellness tips and recipes as well. Cissy is sure to be the belle of the Christmas ball! Of course she attends a fancy ball, nothing as mundane as an office party! Longtime readers will recognize this Cissy as the one formerly listed as my Scarlet Roses Cissy. A customer bought her outfit right off of her and so I had to find another one, which took me a few months. She has paint scraping in her joints and one knee won't straighten. Cissy came to me after a previous restoration. That must have occurred a pretty long time ago, because she needed lots of new work. 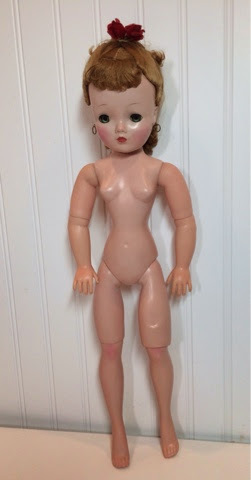 I re-painted her joints, which had paint scraping, and refreshed her cheek and knee blush. 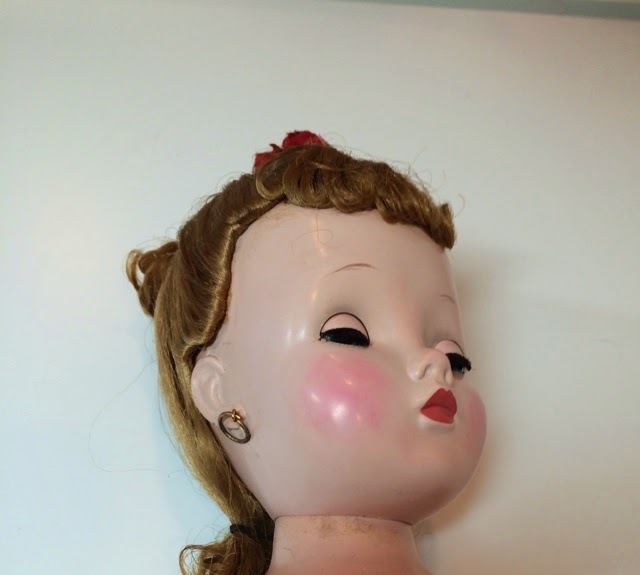 The paint on the end of her nose was chipped and I painted over that. The joints started scraping up again immediately, which is disappointing because I've tried all sorts of varnishes and waxes and things to prevent that. This time I just left the scraping. 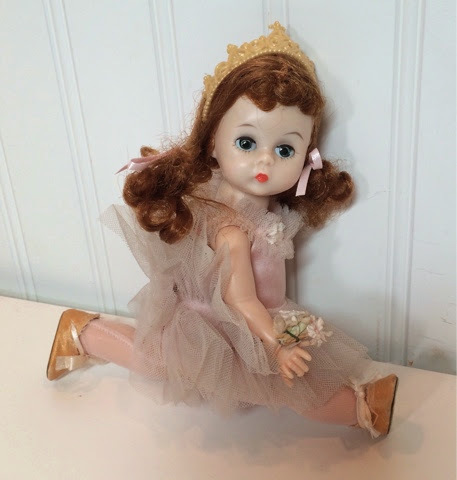 Cissy sustained damage to her leg in the past, which the previous restorer fixed. 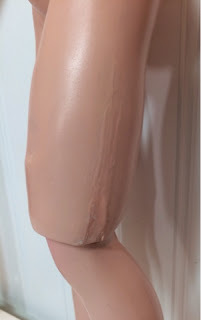 The leg still has a dent and the knee doesn't completely straighten. I didn't feel like I could do any better repairing it so I left that repair alone. I gave Cissy pantaloons to wear to help hide the damaged leg. I think these roses are original. 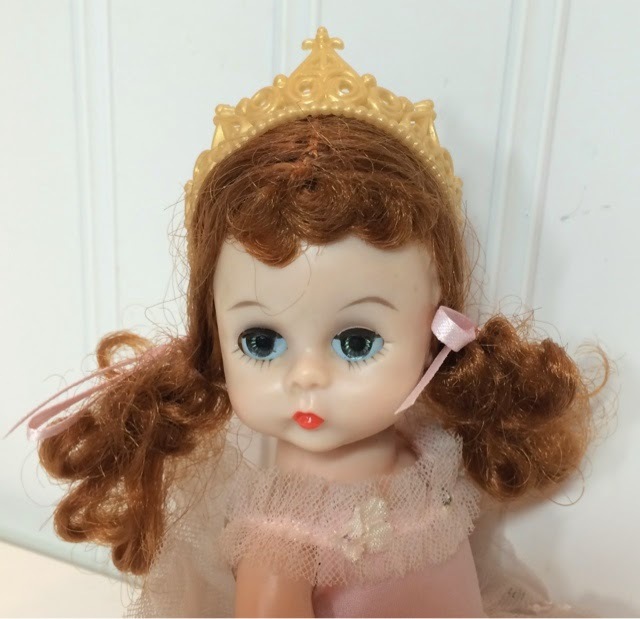 This Cissy caught my eye and cost me more than a typical Cissy because she has a very unusual hairdo. 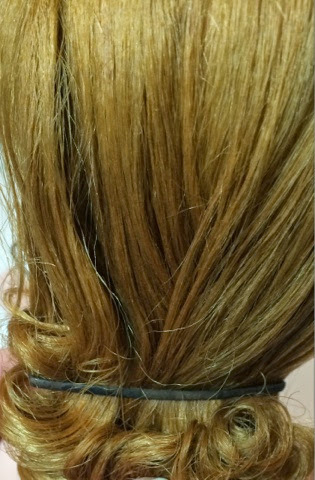 Her hair is styled in an elaborate style, with part pulled up and the rest gathered into curls at the nape of her neck. I've never seen this hairstyle before, but I do think it's original because the barrette fastening her curls looks just like the typical Cissy barrette but is placed in a different spot. 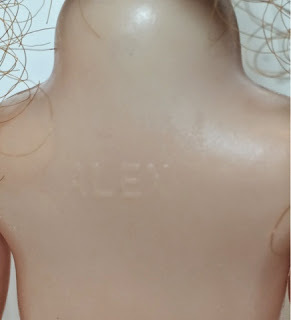 The wig retains its original pins and the roses are fastened right into the wig cap next to the pins so I think they were placed when the doll was made. 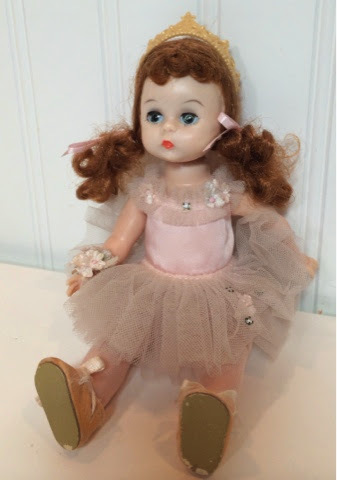 I have not been able to identify this doll, but I do know a Cissy was made with roses in her hair in 1958. 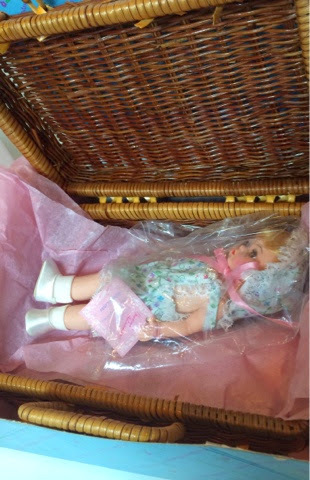 She was #2026 but I've never seen a photo of that doll. I surmise this might be she, but can not positively affirm that. 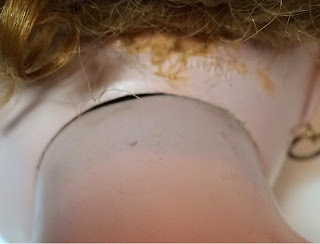 Unfortunately the previous restorer, in an apparent excess of effort to keep Cissy's hair in place, applied a great deal of hair gel or hair spray to the wig. I cleaned it as best I could and removed as much as I felt I could remove without the hair losing its style, but the hair is still quite stiff. 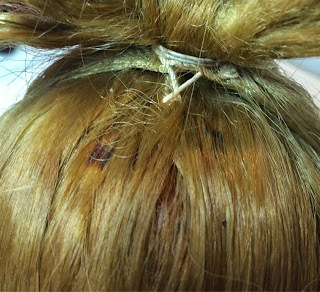 There are a few tiny red and green spots on the side of the wig and some thinning of the hair at that point. 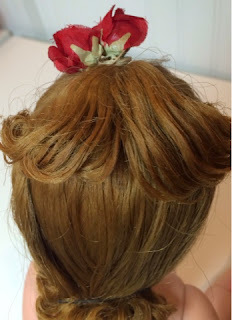 It makes me wonder if additional roses were once pinned to the sides of the wig. Cissy's gold hoop earrings are original and are also quite rare. I've only seen these a couple times. 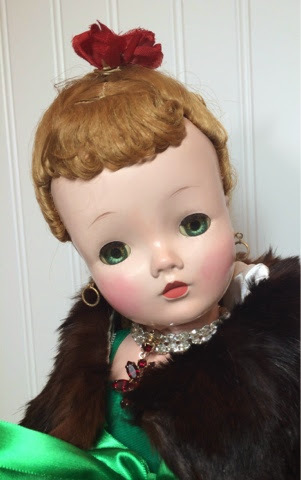 I think this Cissy is a very special and unusual doll! Since Cissy's neck paint started scraping in the joint again I made her a choker necklace from vintage rhinestones and an old clip earring. 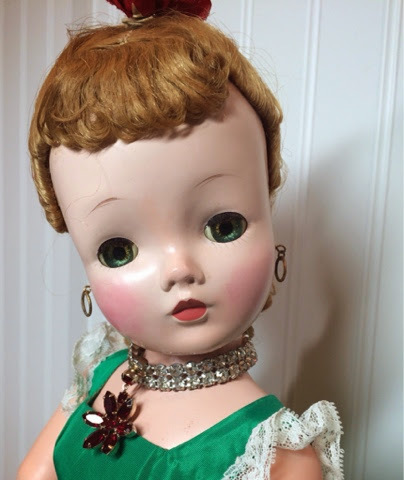 The poinsettia earring charm can be removed after Christmas, but Cissy felt it was perfect for Christmas! 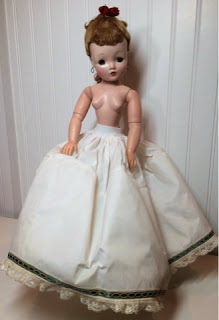 I replaced the elastic in the crinoline waist. The outfit I found for Cissy is the Scarlett portrait outfit #2292 of 1975-76. 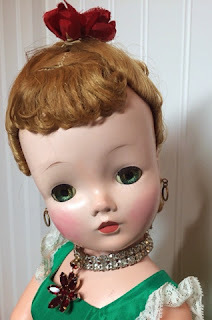 The doll had been played with and the bonnet and jacket sustained damage and pieces of the costume were missing so I didn't feel bad taking the gown and underclothes for Cissy. The pantaloons hide the damaged leg well! The slip has some little black marks and yellowing of the net underneath which I wasn't able to remove and I replaced the elastic in the waist. 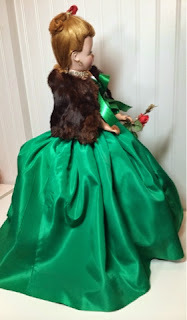 Cissy wears a real fur stole. The stole is fragile and very old. The stole has a satin lining. 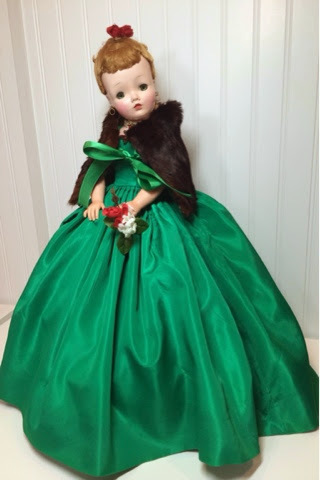 Cissy knows she looks lovely in her gown, but it's rather chilly and she feels she needs a certain something extra to set herself apart. 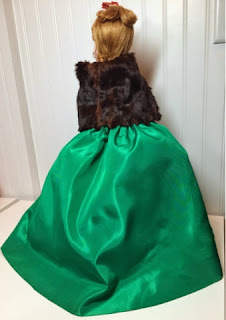 She remembers her fur stole with a two tone satin lining and ribbon closure that just happens to match her gown perfectly. Cissy looks exquisite and feels much warmer. 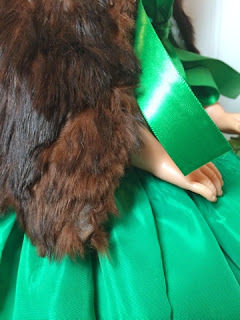 I made Cissy's stole from an antique child's muff. I would guess from the fragility of the fur and the batting, which was real wool roving, not a synthetic or cloth product, stuffed between the fur and lining, this muff was probably at least 100 years old. I think it's beaver fur but I'm not positive. It's very thick and soft. It was falling apart and had several bald spots and tears. Re-purposing it took me an entire day! I cut the best pieces of the fur off and sewed them together. Then I lined the whole piece with white satin and put on a border of green ribbon and a green ribbon closure. The old fur is so fragile it tore in one spot as I was sewing it and I repaired that by hand. You will still see some bald spots here and there and the stole does shed a bit, but it's fine for display. It should not be used for play or handled much and it should be stored in a room with good climate control: no attics or basements! Cissy has a marvelous time at the ball, dancing the night away. More than one beau remarks on how beautifully her gown brings out the green in Cissy's eyes! 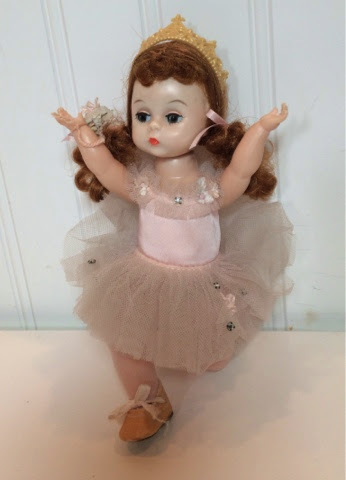 This is an undoubtedly lovely doll, and a rare one as well. 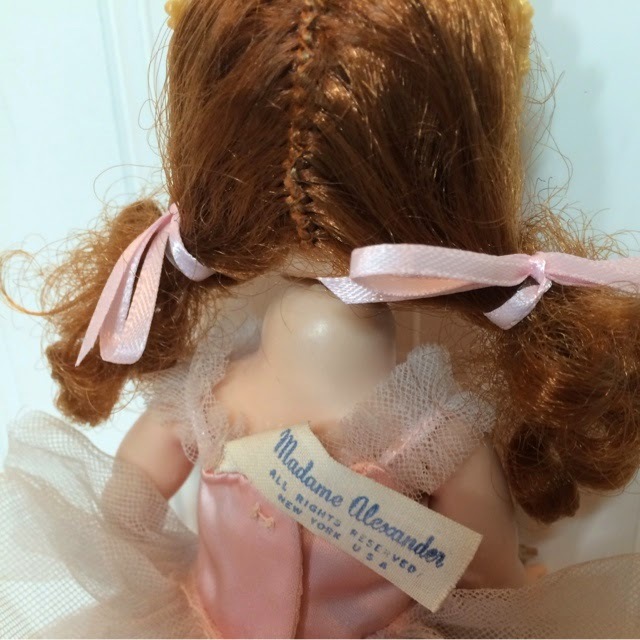 To add her to your collection or to delight your favorite doll collector please visit my store, Atelier Mandaline.